Les Invalides contains some real historical treasures for Napoleonic enthusiasts, including all aspects of Napoleon Bonaparte's life. Housed within the complex are the Musée de l'Armée and Musée des Plans-Reliefs, Musée de l'Ordre de la Libération and L'Eglise de St Louis. It was finished in 1676, although the dome was completed after 1708. Les Invalides features heavily in the storming of the Bastille as its store of 28,000 weapons was stolen by the mob that attacked the fortress on 14 July 1789. 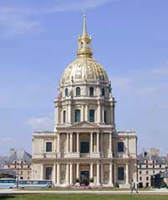 Les Invalides is probably best known, however, for being the final resting place of Napoleon Bonaparte. In 1840 the former emperor's body was returned to France and, after a state funeral, was laid to rest. The funeral procession moved from the Arc de Triomphe down the Champs-Elysées, across the Place de la Concorde to the Esplanade and then to St Jerome's Chapel where his body lay until his final tomb was completed in 1861. Nearby is the Hôtel des Invalides, founded by Louis XIV to look after old soldiers and this includes the Church of Saint Louis. In its chapels are the tombs of Napoleon's brothers Joseph and Jérôme, of his son the King of Rome and of the marshals of France. Napoleon's uniforms, personal arms, and death bed are displayed in the Musée de l'Armée in front of the Invalides.